In an issue of New Phytologist, Claire Belcher provides a wonderful summary about work by Bond and Scott (from same issue) on the ecological role of fire in the spread of angiosperms (flowering plants). During the Cretaceous (145.5 to 65.5 mya, ending with extinction of dinosaurs), angiosperms were fast growing, weedy and largely understory herbs, shrubs and small trees more likely to colonize edge or disturbance sites. 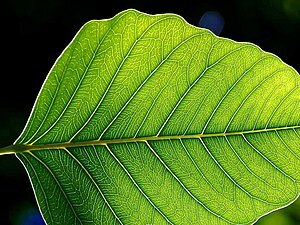 An improved plant vascular system, including a large increase in leaf vein density, doubled the photosynthetic rate and increased leaf mass in comparison with ferns and gymnosperms, which were the dominant land plants at the time. This adaption allowed angiosperms to work more efficiently fixing carbon from falling CO2 levels of the period. Fire also appeared to play a vital ecological role in the spread and ultimate dominance of flowering plants on earth. Fossil charcoal demonstrated the presence of fire in the early ecosystem. The combination of highly flammable detritus from weedy angiosperms and increasing atmospheric oxygen levels created an angiosperm-fire cycle equivalent to modern prairie fire cycles. Once an ecosystem was fire damaged, the faster growing angiosperms out-competed both gymnosperms and ferns. The early fossil records indicate that fire activity was greater during the Cretaceous than in previous epochs. However, when oxygen levels dropped about 56 mya, fire-cycles decreased and angiosperm-dominated forests, such as tropical forests, expanded. In fact, the resulting layers of charcoal helped preserve the fossil record of dinosaurs’ last days. Researchers were then able to predict what the Cretaceous forests looked like.